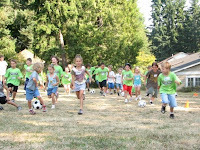 Treasure Chest - a voice of New Life Church in West Linn, Oregon: Sports Camp Success! Our 5th annual Mega Sports Camp was a terrific success! When you hear, "Sports Camp", you might think the week was all about sports. And... we did have a lot of fun playing soccer and basketball. But there were many more important wins than scoring goals and making baskets. 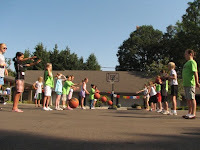 Last week about 85 kids each day heard the good news that God has a "Game Plan" for their lives. They memorized Jeremiah 29:11-12 and learned how God used Moses in accomplishing His Game Plan for the Israelites. On Thursday the kids heard how they needed to trust God's plan like the Israelites did when the blood of the lamb spared them from death. We talked about how The Lamb of God shed his blood for their sins so that they could be saved if they would trust in Jesus as their Savior. Fourteen children prayed a prayer of faith and talked to their coaches about following Jesus! Another success was the ministry service of over 30 committed volunteers. A team of high school students and adults joined together to provide a great week for our children of learning about sports and discovering God's game plan for their lives. All of these volunteers gave up their precious time and energy to serve God. One volunteer even took a week of vacation from work to serve! We celebrated the successes of the week at our award ceremony on Friday afternoon and again at the All-Church worship service on Sunday, but why don't you take some time now to thank the Lord for His blessings last week! What a beautiful story!Sounds like there was lots of fun and hard work. That is a good combination. 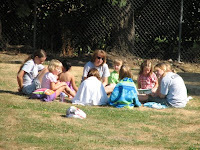 The best part of all of it is God's word being fed to the children. Praise God for the decisions made. Praise Him also for the lack of injury...especially during the hottest week of the year!